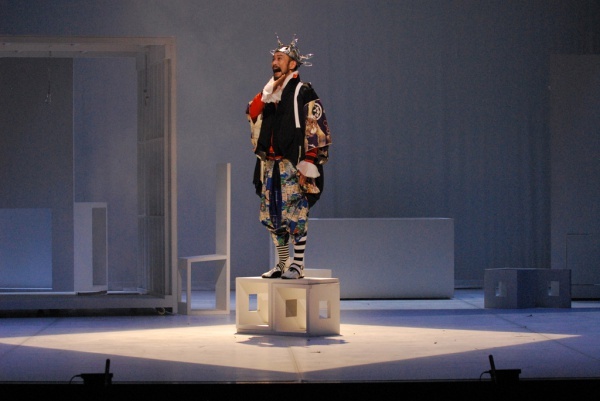 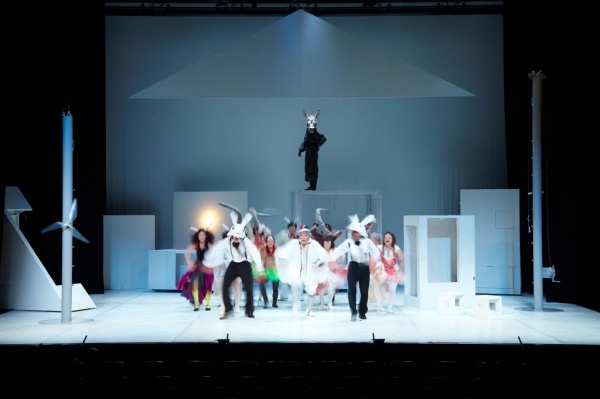 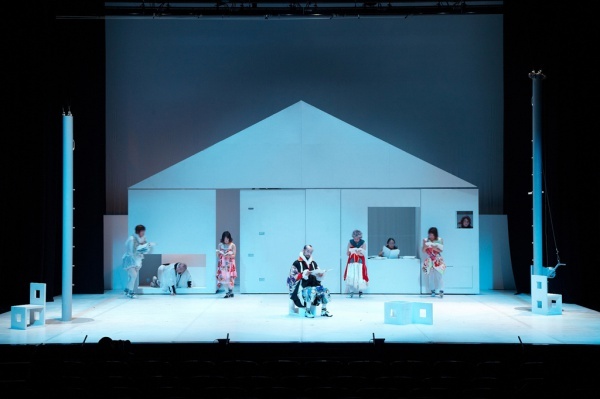 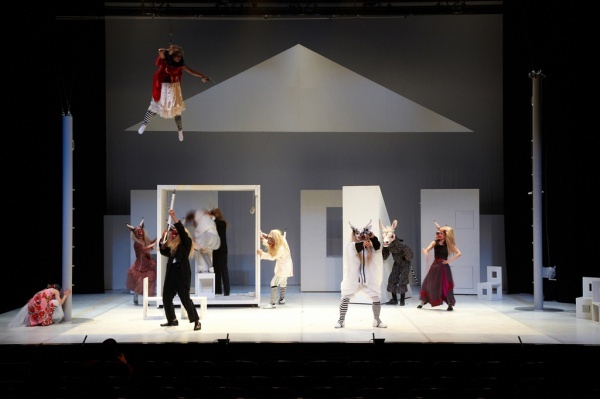 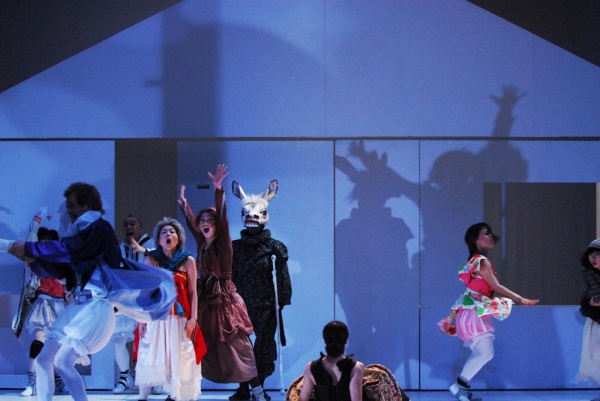 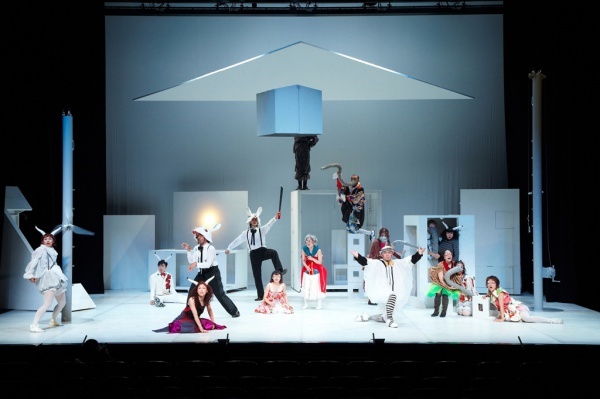 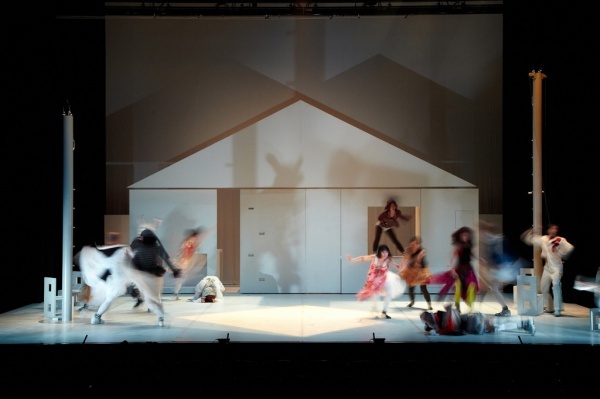 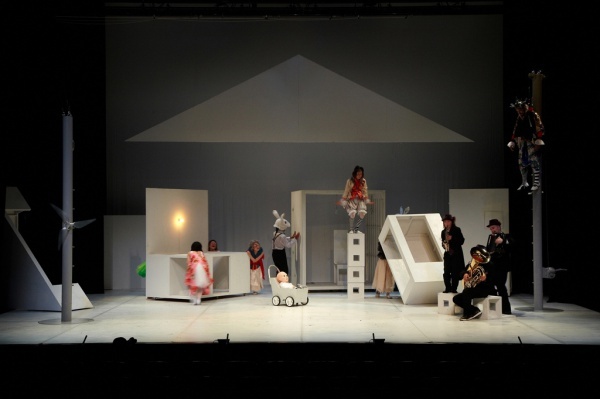 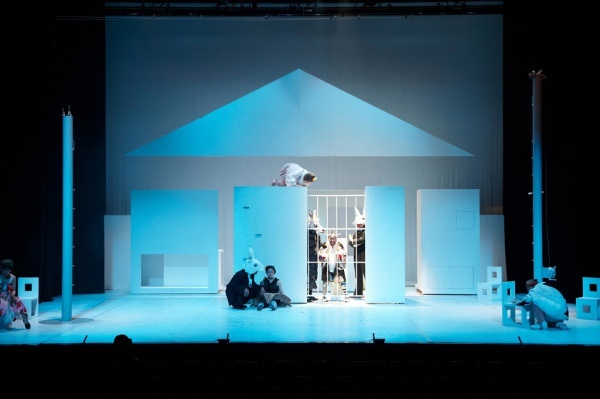 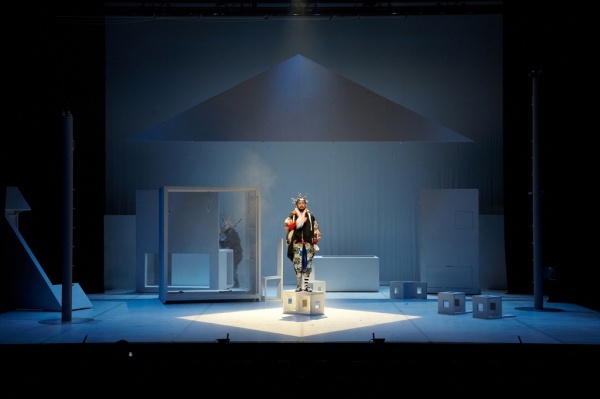 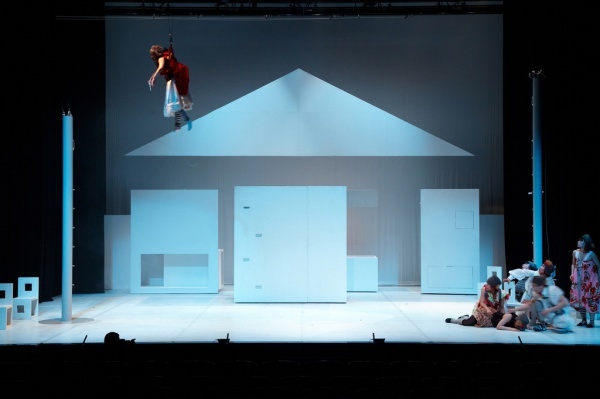 WORKS / Pappa TARAHUMARA "PunK・Don Quixote"
Our involvement with the performing arts scene came through Hiroshi Koike, founder of Pappa TARAHUMARA, to build a stage set for the company’s most recent production: “Punk Don Quixote”. 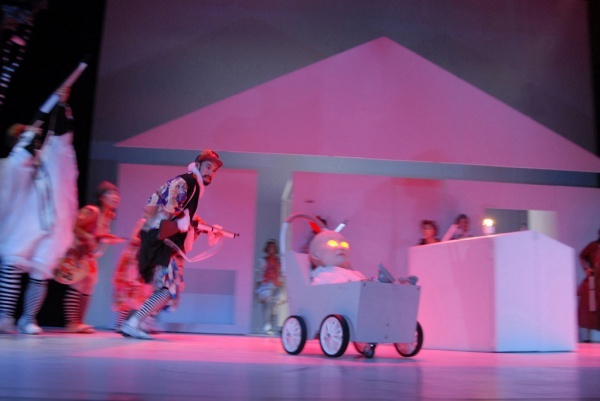 Pappa TARAHUMARA’s performance offers a mixture of theater, musical performance and dance but often defies categorization. 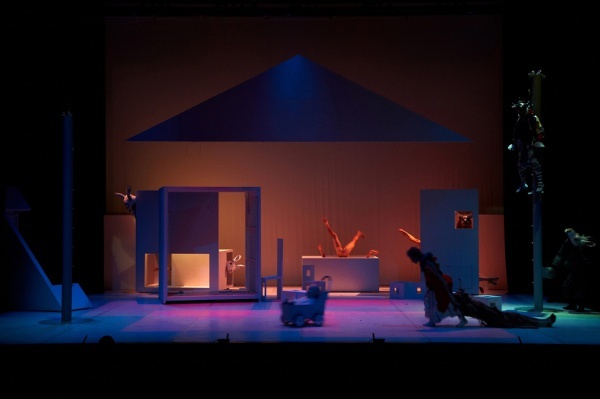 We felt that a static backdrop was out of the question and thus we proposed a stage that would gradually morph, following the play in a dynamic way. 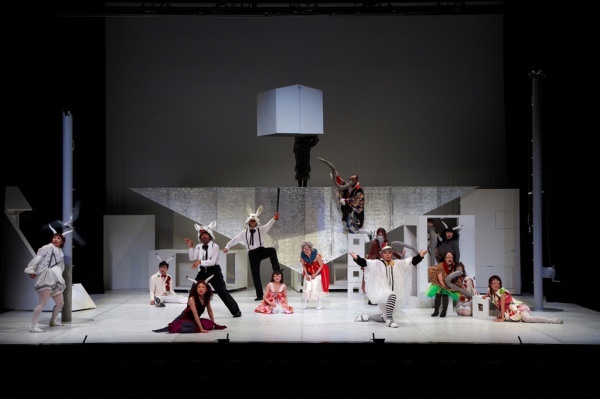 The story revolves around a patriarch consumed by wild delusions and the members of his family. 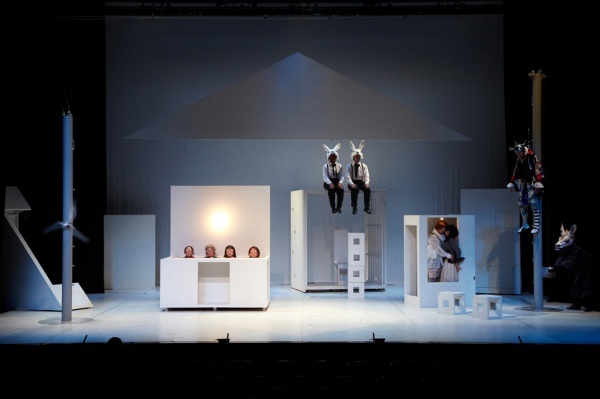 The play deals with contemporary problems in a bright and non-pessimistic manner imbued with hope. 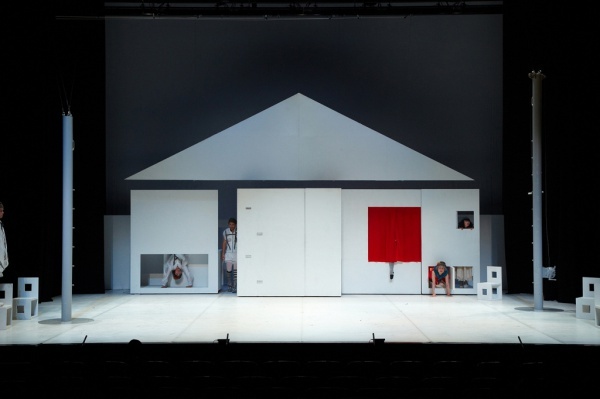 We proposed a stage set with a house whose white walls would decay over time, portraying the family’s own disintegration as events unfold. 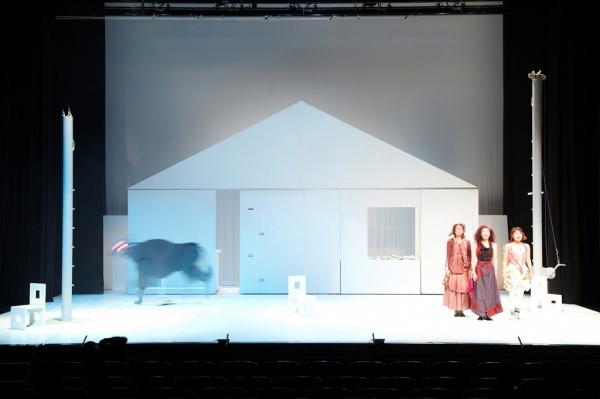 Since Pappa TARAHUMARA’s stage lights are never lowered to accommodate stage rearrangements, a great deal of thought and concern went into details to ensure the actions in one scene would set the stage for the next scene in a transitioning manner. 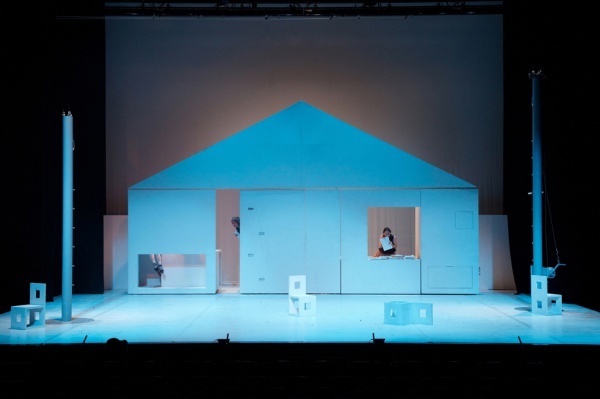 Parts of the structure are turned upside down, moved or removed altogether from where they belong, causing it to gradually lose its purpose as a house. 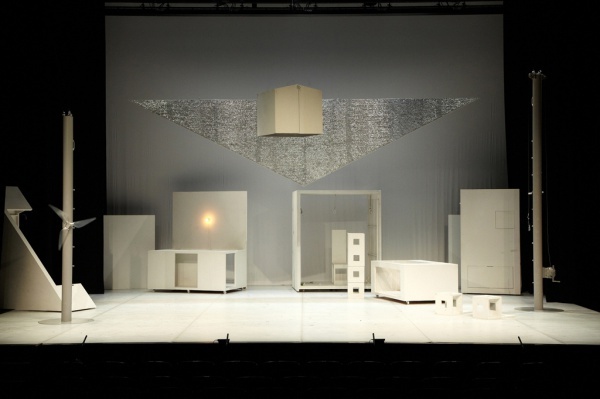 Like a puzzle disassembled into its pieces, the whole stage and its disarticulated parts become an integral part of the performance. 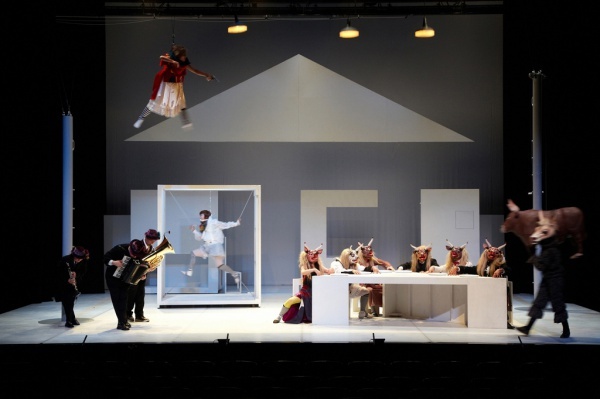 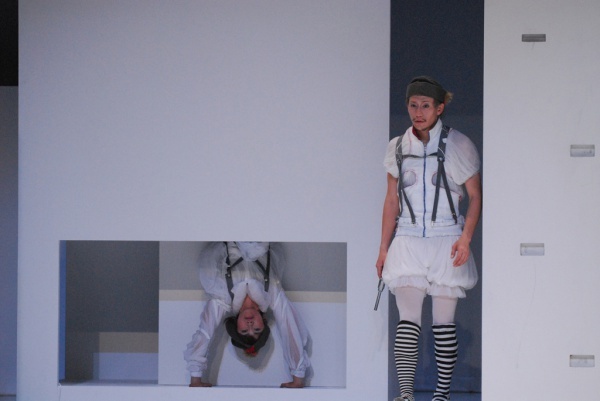 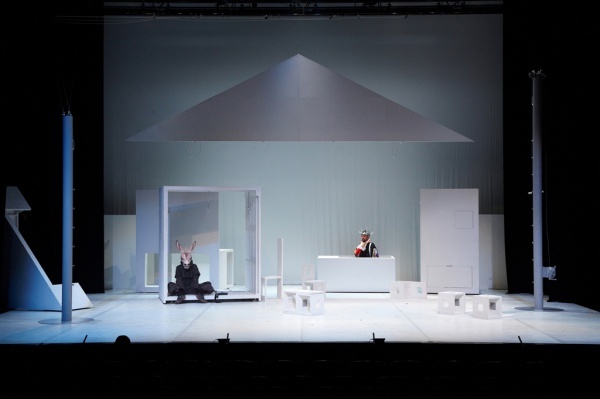 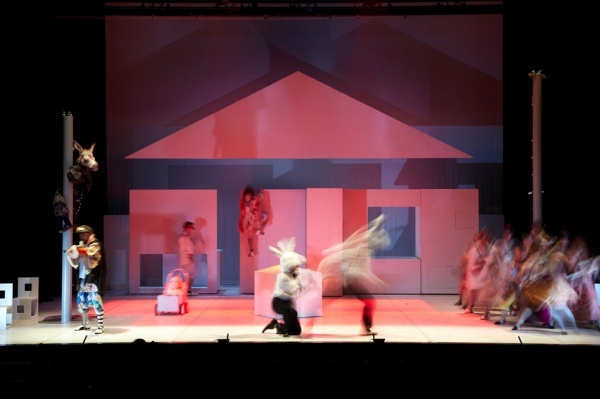 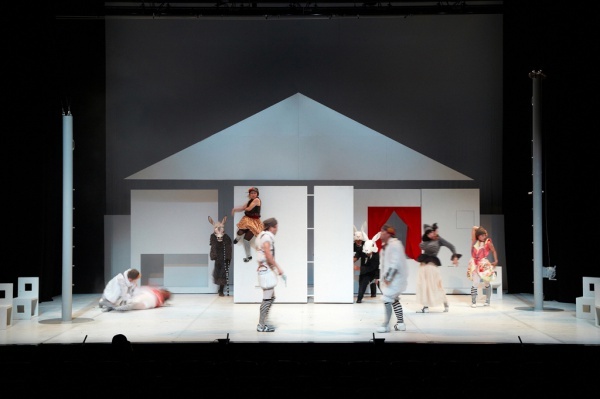 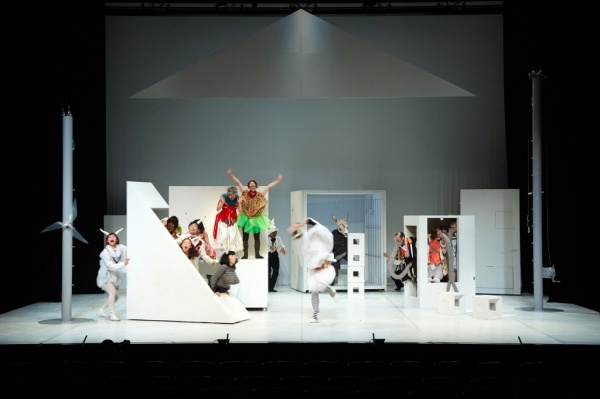 Towards the end of the play, the gable roof is turned on its head, offering a completely different view to the spectator. 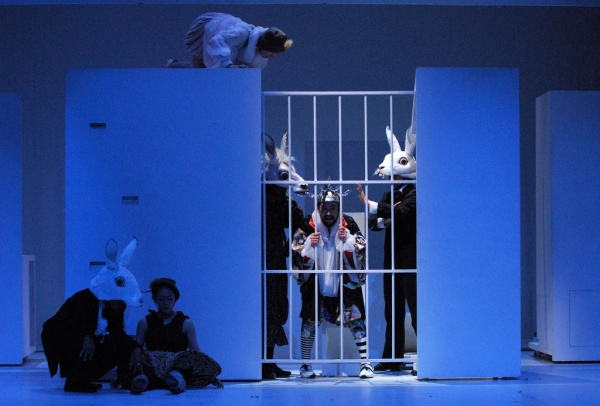 Suddenly, the roles between humans and their strange creatures have been reversed. 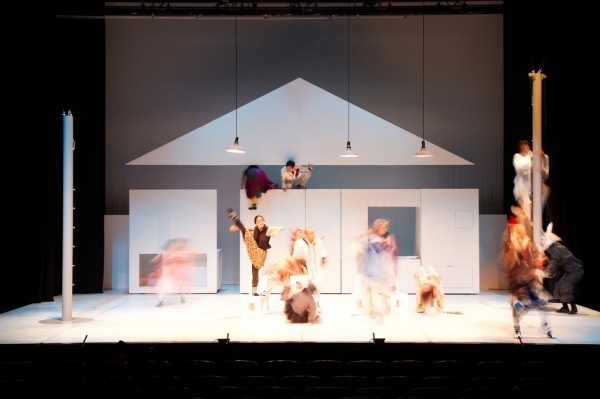 The story culminates with this shocking portrait as the house and its household lay in ruins.